The Devil tarot reminds us how easy it is to forget that we are “spiritual beings having a human experience” and not the other way around, as the saying goes. 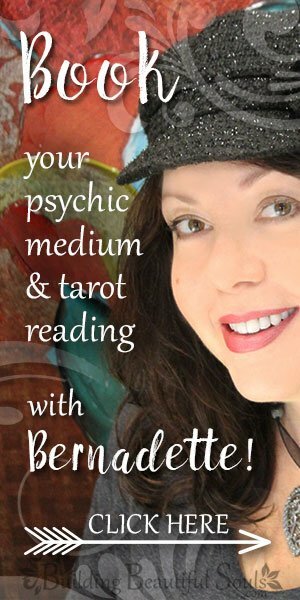 The Devil tarot card does not represent the devil as an actual being, but our illusions and misconceptions – especially those that distract us from our spiritual journey. The Devil tarot symbolizes the distorted image we have of ourselves, the universe, and God. The Devil tarot has nothing to do with Hollywood horror clichés; it is a problem to be solved, a task to be completed through the process of rational analysis. In this process, we learn to distinguish between pure joy and reckless pleasure, and the trappings of religious dogma and true spiritual experience. The Devil’s arms are in nearly the same position as in The Magician, but the magician’s wand has turned into a torch held upside down, and it has slipped into the right hand on the Devil tarot. Instead of drawing in the limitless, eternal light from the divine source, the artificial light of the torch held by the devil of the Devil tarot may be dazzling, but it is temporary, and it only lets you to see what the torchbearer allows you to see. 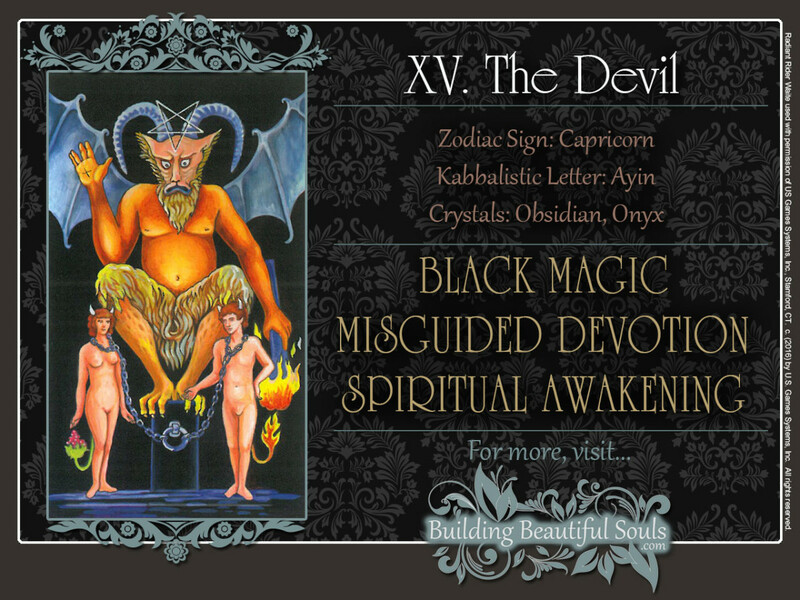 In the Devil tarot card, the grouping of the figures refers to another Tarot trump, the Lovers, which leads from the solar consciousness to the feminine aspect of deity. But the grey, lead colored bat wings here on the Devil card are too heavy to lift your consciousness to those spiritual regions. Illusion has blurred your vision. That’s why in the Devil tarot card the human-like figures below look quite satisfied with their predicament. Note their relaxed stance and the fact that they’re not struggling against the chains holding them to the altar. They can take them off any time they want. To solve this riddle, you must cast off your chains, venture into the darkness and seek the true light. Regaining clarity, a completely different picture unfolds before your eyes. In a sense, this is an initiation allowing you to step into the sight of the divine source for the first time. The Devil tarot card represents attachment to temporary pleasures and illusion. Ambitious Capricorn, associated with the Devil card, has taken you to the highest peaks of what you thought possible. Looking back, you see how far you have come. You think of all the others still stumbling around in the dark. And it feels great. As far as you can see, you have figured it all out. What you don’t know is that the most important piece of the puzzle is still missing. And there is the rub. Things are not as they appear and unless you are willing to solve the puzzle before you, this can create complications at every level of your consciousness: spiritual, intellectual, emotional – even physical. Noted occultist Eliphas Levy wrote that misguided devotion is the most potent of all magical poisons. You may be able cite chapter and verse from your favorite holy book, but does your life reflect the spirit of your faith? Quite literally, the Devil tarot is a caricature of misunderstood spirituality. Maybe you are thinking you have learned all there is to learn. It doesn’t matter if you’re a novice or an expert in your field. Anyone can fall into that trap, and the more you know, the easier it is to get caught it. Your feelings, passions, and instincts are important guides – divine gifts allowing you to feel the joy of being alive or important alarm bells warning you of danger. But they’re guides. Pay attention to them, but don’t let them run your life. Allowing yourself to become too wrapped in temporary pleasures can lead to dysfunctional behavior patterns and psychological or physical addiction. In fact, when the Devil tarot appears in a reading, it may well point to chemical dependency problems in your immediate surroundings. If the Devil tarot card represents someone else, you should approach that person with caution. Such an individual may not be “on the level,” offering to teach knowledge he or she hasn’t yet sufficiently understood. This is someone who is not done struggling with his or her inner demons. The Devil card reversed describes a process of liberation, like The Tower card. But instead of a cosmic lightning bolt that sends everything crashing to the ground, the Devil card represents a gradual process of waking up – a much gentler experience. Over time, you have learned to ask the right questions, and old answers, promises, and excuses no longer satisfy you. Nor do the same old threats frighten you any longer. You have discovered that the pieces just don’t fit. You realize that the torch does not cast much light, at all. The vast black darkness no longer scares you. Instead, it fills you with curiosity. Is it truly endless? Will it really swallow you up? You want to know, and you are determined to find out. By now, you have also come to realize that those chains slip off pretty easily. It is very much in your power to remove them and venture forth. Recovering addicts often refer to this insight as a “moment of clarity,” the point at which the scales fell from their eyes and they saw that a life free from addiction was indeed possible. Whatever has held you in its grip has lost its power over you. In fact, the harder it tries to keep you in your place, the easier it is for you to slip out from under its thumb. It doesn’t matter how menacingly the booming voice from above may command, “Pay no attention to that man behind the curtain!” Just like Dorothy in The Wizard of Oz, you step right up to him and pull the curtain to the side. And you discover that what has held you in awe and fear all along is just a little old man. Ironically, he seems more afraid of you than you ever were of him. The Devil is the fifteenth Major Arcanum. 1, the number of the solar consciousness and image of the divine source, combines with 5, the number of Mercury and pure intellect. Added together, they make the Number 6, associated with Venus and physical love.